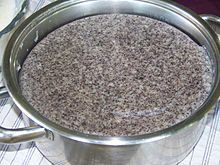 Lapa prepared with poppy seeds. Lapa (Turkish) or lapas (Greek λαπάς) is a kind of rice porridge or gruel eaten in the Balkans, Levant, and Middle East. It is made of just rice, water, and salt and has the consistency of a thick soup. This page was last edited on 27 June 2018, at 16:46 (UTC).